Refresh your home or business with Zero Dry Time. Our dry carpet and upholstery cleaning system has revolutionised the carpet cleaning industry. Our service offers a genuine dry organic system which controls the moisture used. This means no more wet carpets, no more hours of overnight airing and immediate use of your carpets straight after your professional dry cleaning process. Our cleaning system ensures effective and efficient stain removal, eliminates mould, mildew and damp smells. You are left with clean, dry, fragrant carpets. 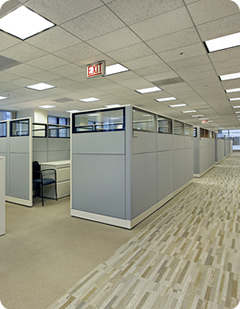 Research shows that a vast majority of dirt and dust in a public building is carried in by pedestrian traffic. Our range of walk off mats provide an instant barrier against this type of contamination. The highly absorbent mats also provide a great barrier against wet floors, reducing the hazard of slippage. We also offer a superb branding service whereby, your logo can be printed directly onto your mat to provide a powerful first impression. Impress your customers today with personalised door mats. 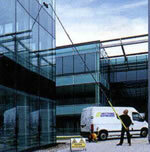 Uses a water fed pole system to clean glass. The science behind the system which produces sparkling windows is a high level of water purification. Using 99.9% pure water guarantees spot and stain free windows. Pure water leaves no residue, unlike regular cleaning methods which use a detergent, a micro film is left behind which attracts dirt more quickly. Our pure water system, delivers a sparkling result, which will last for longer and is completely eco-friendly. 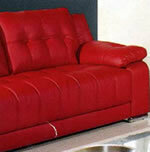 We have an extended, tried and tested range of leather-cleaning maintenance and repair products. Whether you have scruffs, fading, colour loss, stains or dried-out leather, we can clean, protect, feed and re-instate the aroma into your tired leather. We have undertaken major research and development into each and every product to ensure you receive a highest quality method which meets the needs and requirements of the job in hand, tailored to meet your specific cleaning needs. We offer a holistic range of cleaning for all your needs. We will make your leather products look new.